Last Friday, senior Jennifer Nguyen held Diversity Day and is painting a mural sporting all the different races at Fountain Valley High School for her Gold Award. The Gold Award is the highest achievement Girl Scouts can earn. The award is exclusive to Girl Scouts only and challenges them to solve a problem in their community and taking action to fix it. Nguyen has been working on her Gold Award for the past year, planning and executing out her mural and Diversity Day, which a turnout of over 100 participants. “My project seeks to fight racial intolerance by promoting acceptance of classmates of all ethnicities and backgrounds, and to educate students on the ongoing discrimination that is continuously occurring in our nation and of how we should encourage diversity instead,” Nguyen said. 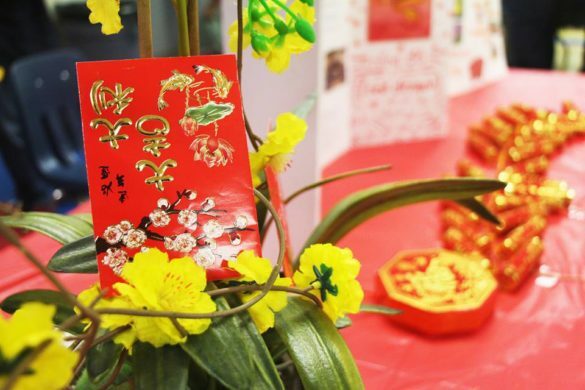 Eight cultural clubs participated in the event: Vietnamese Student Association, French Club, Campus Pride/Gay Straight-Alliance, Baron Bridge Builders, Connect2Asia, Muslim Student Association, Peer Assistance Leadership and Japanese Club. They all set tri-folds up and put items on display, which represented their club’s background and showed how their diversity impacted campus life and the community. Many guests reported the event to be very insightful and well educated about all the cultural clubs at school, allowing people to have long, open discussions with the booths. Although the mural is still under construction, Nguyen has been working on it for months, staying after school every other day with help from friends or volunteers from the Art Club. “I designed the mural depicting students of different races and religions in graduation outfits, symbolizing how despite having different ethnic, cultural or immigrant backgrounds, we all have the opportunity of receiving an education, pursuing our dreams and are deserving of respect and acceptance on campus and in our community,” Nguyen said.